What to Do If You Are Falsely Accused of a Crime? 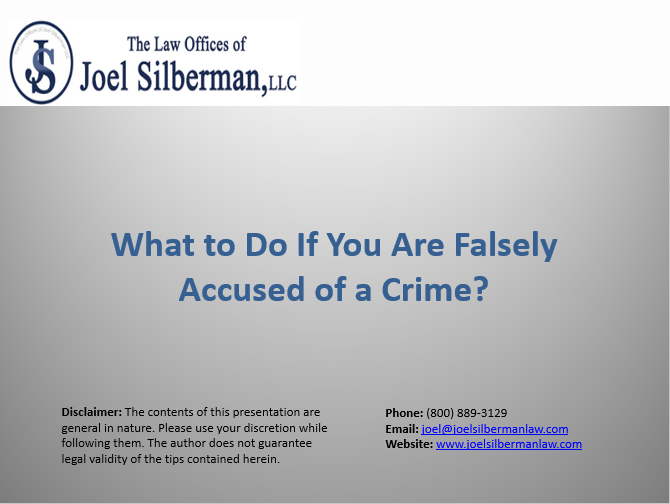 Slideshow | What to Do If You Are Falsely Accused of a Crime? A false criminal accusation can have serious consequences. Under these circumstances, hiring a criminal defense attorney, gathering evidence and witnesses, and staying away from the accuser are some of the best ways to handle the situation. If you have been falsely accused, our experienced criminal defense attorneys can help protect your rights and assess your options. Call 201-273-7070 or 800-889-3129.